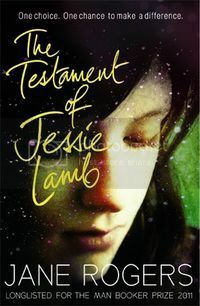 The Testament of Jessie Lamb by Jane Rogers (review copy) - Women are dying in their millions. Some blame scientists, some see the hand of God. As she watches her world collapsing, Jessie Lamb decides she wants to make her life count. Would you let your daughter die if it would save the human race? I had no idea what to expect when I first picked this book up. The description above gives a vague but intriguing glimpse into what is actually a really strong, thought-provoking story, and once I started reading, I was swept away. Jessie is living in a world where terroist have created and released an airborne virus which every single person in the world contracts. This virus is Maternal Death Syndrome (MDS), which is only triggered in women once they fall pregnant - which leads to their death and that of the foetus. Women are dying. There are no new babies. Once everyone alive has grown old and died, there will be no-one left. No-one. Scientists are constantly working on finding a cure, or of finding a different way for babies to be born. Different groups form. Youth activist groups, who blame the adults for their way of living that has destroyed the world, with pollution and greed. Teenagers decide to break away from adults, and try living on their own, self-sufficiently. A religious group is formed which say the virus is God's punishment for the way people have been living. They call themselves the Noahs, believeing this virus to be today's version of the flood. A Feminist activist group forms, Feminist Link Against Men, to stop scientists experimenting on women, when they're already dying. The Animal Liberation Front forms to stop scientists experimenting on animals. And then there is a scientific breakthrough. One that could change everything, and save the human race. One that Jessie believes in, and would give her life for. As you would guess, The Testament of Jessie Lamb is quite political, but heavily so. Those who aren't interested in politics shouldn't let this side of things put you off; the politics in the book is less about being political, and more about showing how the world reacts to this apocalypse. At times, it's quite amusing and astonishing to see what fear for the world, fear for self, can bring out in people; the opinions, the ideas. Their commonality? The urge to act, to fight, to cling on to life and to try and survive. Apart from the Noahs, who I found to be quite cult-ish, I could understand and agree with the points of each group that formed. Yet, I kept thinking, when the existence of the human race is in the balance, shouldn't ALL avenues be explored? What I found really scary about this book is that it isn't set a silly amount of years into the future. This story could happen tomorrow. It's the creation and release of a virus. That's it. And BOOM, we're screwed. It really makes you think about the world we live in. Are scientific advances really a good thing? Sure, it's cientific advances that are helping to solve the problem in this book, but it was also scientific advances that caused the problem in the first place. Jessie also thinks about the future; if the developments work, and the human race can continue, what world are we giving them? A world with global warming due to pollution, a world that is running out of oil, food and water. Things that should have been dealt with years ago, but now may be too late. The issues politics and science and conservation overlap, and lead to an extremely thought provoking novel. So thought provoking, I don't know what I think, because good points are made for each. But more than all this, the story is about Jessie's decision over whether to act. I don't want to spoil it for you, but wow. I'm not even sure I can discuss it without telling you what it is. But it makes you ask the question, if this was your world, whatt would you do, how far would you go, to save the human race? If there was something massive that needed to be done that you could do, would you do it, no matter the personal consequences? The thing Jessie has to decide whether she wants to do is the most selfless, bravest and awe-inspiring things I have ever read. Seriously, the whole idea brings tears to my eyes. I sincerely hope, if I was in her position, if our world ended up like Jessie's, I would make the choice to act. If this book has a negative, it's that I didn't really care much about the characters. I just didn't warm to any of them. I cared about the what was happening, how things would pan out and what decision Jessie would make, but I didn't care that much about Jessie, her parents, her relatives, or her friends. There was just something missing for me, and I couldn't connect or relate, even though they were just normal, ordinary people. But the story itself does make up for this, and is still a really good read. A powerful, thought-provoking, mind-blowing novel. This is one of those stories that will stay with you long after you've closed the book. I highly recommend it! Thank you to Canongate & Victoria Park Books for the review copy. Wow -- nice review! I'm going to have to pick this one up! In case of any confusion, I'm also Jo - hi! Lol. Thanks for stopping by! Thank you :) It's a pretty good book! I really enjoyed it! Hope you enjoy it if/when you read it!